Migrating or transitioning to a healthier diet and lifestyle is not easy for many people. Our daily lives are fraught with temptation, vices and bad habits we have built up throughout our lifves. Modifying our bad behaviors, habits and diet is akin to quitting a substance, like tobacco or alcohol. For each of these substances there exist physiologial, psychological and emotional/social triggers. We must recognize that our diet does have a physiological, psychological and emotional/social hold on us. Regradless of the hold We need to be able to take one step at a time into wellness and fitness. Trying to look at it longer term is not always the best approach. Here are 5 things that will can help you in your fight against breast cancer. No matter what your exercise thrill is, locomotion and movement have a positive affect on our mind, body and soul. We are not in a competition so go soft and ease into it if you have not exercised in a while. Try walking at first. A light walk is also a great way to suppress your appetite, allowing you to reduce calories while also avoiding them when you get that craving. In July I read a fascinating article by Gretchen Reynolds of the NY Times on How Exercise Changes Fat and Muscle Cells, it is worth the read. 2. Add a whole grain. Add a new or different whole grain to your pantry this week. Whole grains contain higher amounts of fiber, vitamins, minerals and compounds only found in plant based foods. Additionally whole grains promote a balanced blood sugar, reducing the amount of insulin your body produces to counteract the spike in blood sugar common to refined grains and flours. Apples, pears, plums, clementines, tangerines, and berries are still in season in many markets. Including more plant based foods in our diet increases the amount of phytonutrients and phytochemicals that our body needs to maintain optimum health and wellness. When you are able to try to buy organic produce. This also helps support the economics of smaller food systems, which, in turn, promote choice in the stores. Non organic selections can contain higher residual levels of chemicals and pesticides. Beyond the phyto-based properties, eating plant based foods allows us to increas our fiber, feel fuller and consume less calories. If you are control oriented person (my wife calls that a control freak), like me, then cooking for yourself and those you love is a natural process. According to the American Heart Association nearly three quarters of the sodium we consume is hidden in the processed foods we eat. 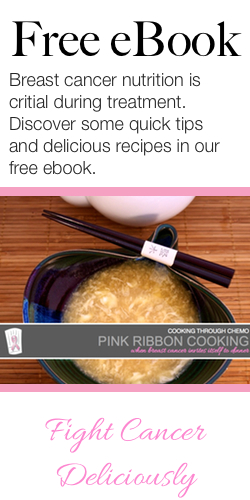 By cooking your own meals you choose how much sodium and other ingredients go into your food. Excess sodium promotes inflammation, which is a known risk factor for breast cancer, among other chronic and degenerative diseases. 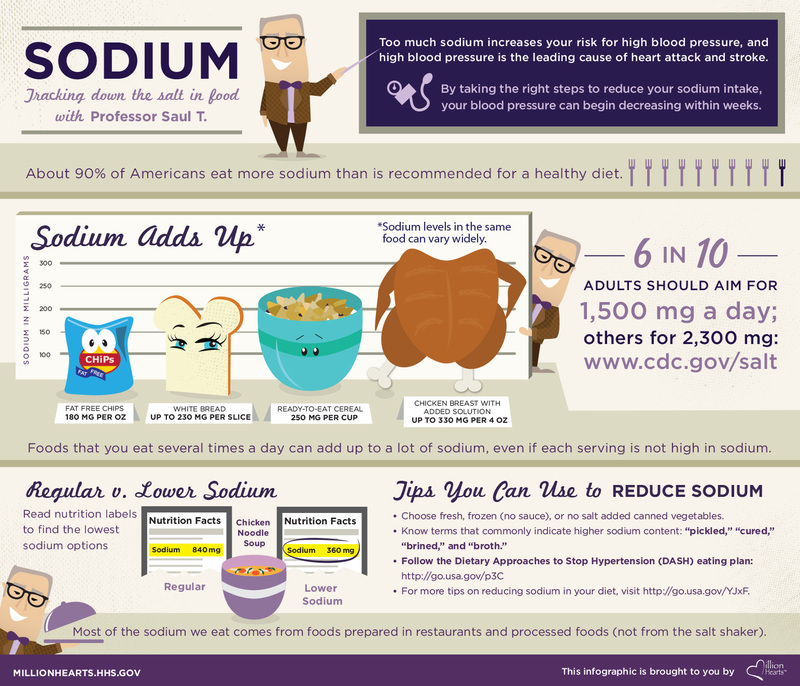 This infographic offers some of the sources of hidden sodium and offers our daily recommended amounts. I can attest that sodium levels are the hardest part of working our recipes for nutritional acceptability, and only when we remove processed foods are we able to offer a recipe that has a great flavor, health attributes and that cravable factor. Simply put, you should begin your day with a 300 to 400 calories, protein oreinted breakfast. By eating breakfast you will fend off more mid mroning cravings and you will put a quality calorie where and when it is needed so your body may function the way it should. For some eating breakfast is difficult, both from a time and behavior factor. A simple egg preparation on a slice of whole grain toast is a great way to begin the day and it can be done in less that 5 minutes. From personal experience I can say that if you take the time to prepare a nutritious breakfast and fit in a 15 minute walk you will reap the rewards throughout the day. Fighting cancer can be delicious, and it should be. Plan for tomorrow and take that first step of your wellness and prevention journey.